Growing your practice with A.I. 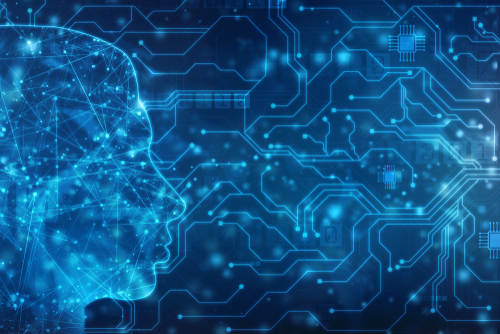 Incorporating artificial intelligence (AI) into your digital marketing efforts can enhance the user experience and help your practice grow. Aesthetic Society News is the quarterly informational newsletter established by The American Society for Aesthetic Plastic Surgery (ASAPS), a distinguished international association of board-certified plastic surgeons. This newsletter provides plastic surgeons and marketers with educational content to help professionals expand their reach and stay current on the latest innovations in the industry. 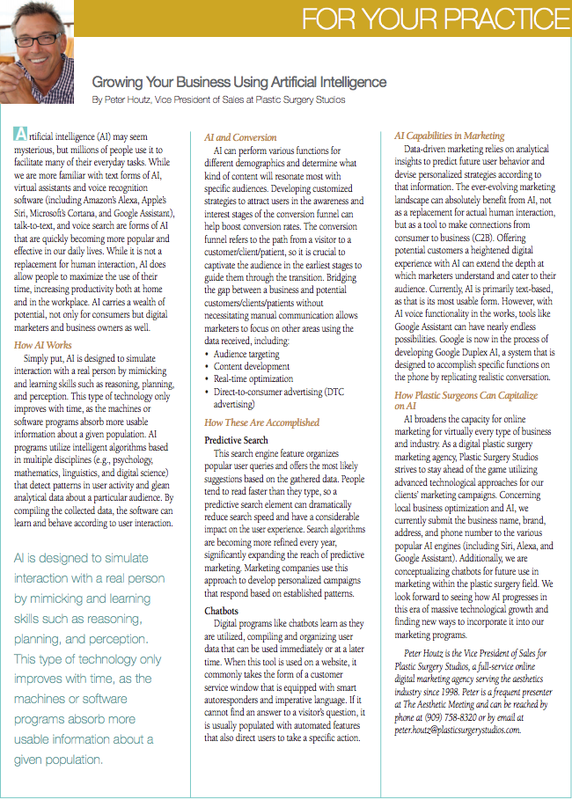 Plastic Surgery Studios was graciously asked to contribute to the Winter 2019 issue of Aesthetic Society News (article on page 63) with insight into how practices can improve their marketing strategies using artificial intelligence. Artificial intelligence (AI) refers to programs that are designed to imitate human interaction. Recent advancements have made it possible for these technologies to gather information based on user patterns and learned skills like reasoning and planning. The foundation of AI lies with sophisticated algorithms that utilize various disciplines to compile analytical data that help stimulate communication that is most familiar with a particular audience. Which AI Programs Are Available? What Can AI Do for Marketing? In marketing, the path consumers take from casual browsers to conversion is often referred to as the “conversion funnel.” The first and arguably most crucial part of guiding people through the conversion funnel is the awareness stage. This is the time when a practice has the opportunity to pique the interest of potential patients or clients. By using search engine features (i.e., predictive search) or chatbots, marketers are now able to satisfy user queries to move them along the funnel and also to glean user data that is specific to the target demographic. This data can be used to create targeted campaigns to drive higher conversion rates across an omni-channel mix. By applying this information to a campaign in real time, audiences can have a more personalized and appealing user experience (UX). AI also provides the necessary tools to automate tasks, allowing marketers to focus on building these data-driven campaigns with sustained growth.